ZZ Top's Billy F Gibbons has teamed up with Gibson to build the spectacular Billy F Gibbons Goldtop. Gibson are calling it a 'ground-up revision' of the Les Paul, as Gibbsons teamed up with the company to build a guitar to precise designs that tweak everything from construction to electrics. 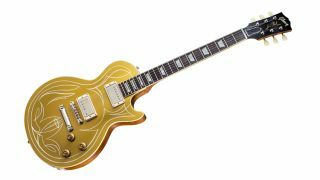 The guitar features a maple top with a Goldtop finish and unique pinstripe design (from the mind of Billy himself, no less), a pair of Pearly Gates pickups and a mahogany neck with a maple spline. The Billy F Gibbons Goldtop has a price tag of $5,665 and will be limited to 300 models, with 150 VOS and 150 hand-aged with Texas-shaped buckle rash thrown in for free. 50 of the guitars will be played by Gibbons himself. Billy F. Gibbons doesn't pull any stylistic or tonal punches, so you'd expect his take on the seminal Les Paul Goldtop to be a knockout—and it is. The first ground-up revision of Gibson's stunning original solidbody electric in over 60 years is a masterpiece of style. In addition to its luscious goldtop finish, it features a unique pinstripe design created by Billy himself, which is hand-recreated one at a time by respected hotrod-pinstripe artist Rick Harris and a Gibson artist trained personally by Rick. Sonically and visually, the guitar blows the doors off the venue with a neck profile measured precisely from the Rev's own Les Paul, ultra-light construction, custom electronics, and a pair of Seymour Duncan Pearly Gates pickups. 150 Billy F. Gibbons Goldtops will be carefully hand-aged, with 50 of them played and hand-signed by Billy himself; each of these will have the added kitsch of a Texas-shaped "buckle rash" wear pattern adorning its back. A further 150 VOS models round out the Limited Run of 300 guitars.